David Miliband set out his concerns about the predicament of the European left in a speech at LSE this evening. The full text of his speech is available at Labourlist here, and Next Left has a little post from earlier here. Left parties are losing elections more comprehensively than ever before. They are losing from government and from opposition; they are losing in majoritarian systems and PR systems; just for good measure they are losing whatever position the party had on the Iraq war; and they are fragmenting at just the time the right is uniting. It’s from this point on that it’s possible to examine Miliband’s words, and also try to propose some first hints of ways forward. First of all the very contention that the ‘right is uniting’ is not universally clear. While Merkel might be in a centre-right administration with the FDP, it has been far from plain sailing. The polls from Sweden that many did not vote Social Democrat (Socialdemokraterna) due to their likely alliance with the Left Party (Vänsterpartiet) should be set against the fact that the election winners were a four-party coalition led by the Moderates (Moderaterna). Miliband berates this electoral fracturing on the left, but does not explain how this issue should be solved. The Left Party in Sweden or The Left (Die Linke) in Germany are not going to go away (more on that here), so the emphasis has to be on making centre-left alliances palatable to voters of all parties, rather that traditional centre left parties trying to beat each other. Related to this is how the parties of the traditional left communicate to their voters. Miliband interprets this in terms of voters feeling economically squeezed, that they already pay as much tax as they can tolerate, and how centre left parties have to cope with this constraint. I would look at this matter somewhat differently, in terms of framing of the left’s message. Miliband is right to say that any vision for the future of the left has to embrace the reform processes of the 1990s, New Labour, Die Neue Mitte etc., and learn how to move forward from those. Simply turning the clock back, looking to the 1980s or earlier for inspiration is not going to help deal with the problems of the 2010s. Yet conversely – particularly in the UK and Germany – there is still much bitterness in the public discourse about the records of the Blair governments (mostly on Iraq) and Schröder (mostly about Hartz IV). It must be Miliband’s hope, in the UK at least, that after a year or two in opposition that the electorate thinks back to Labour’s 12 years in power with a little more fondness. In terms of ways forward I think Miliband, Labour and the left in European countries need to look at output legitimacy rather than legitimacy just because something is done by the state, and to focus on individual citizens and their relations with the state and with power. “We are socialists not statists” is how Miliband puts it, and he is right. The future of the left must be about the values and the outcomes, not about the distinction between public and private, or public and third sector. This would also free Labour to find ways to work with community groups, a point Miliband goes out of his way to underline. Overall it’s hard to disagree with the gist of Miliband’s analysis. This, it would seem, is stage 1 – a thorough analysis of the problems. Stage 2 would be some more fleshed out proposals for a way forward, and Miliband is going to be as good as anyone on the left to look to do just that over the coming months. 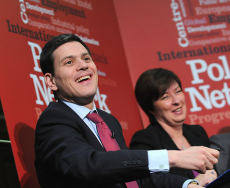 David Miliband gave an interesting interview with Andrew Marr. He talked about his thoughts on the European Left and proposed some solutions. E.G He suggested that MPs should get more invovled in the community – hence his new string of activities joining FC Sunderland, “the nearest FC to my constituency”, etc. He gave the impression that he clearly wants back in the game, and is playing for the longterm. It all looked a bit uncomfortable for his brother, Ed. I went to a FEPS event recently, where the consensus emerged that the center-left does indeed have a credibility gap. Why are socialists going along with what are essentially liberal policies? Why does the center-left often also often swing to the right on issues such as iraq, and privatization. They are failing on their promisses, they are failing to their voters and constituents (perhaps following the median voter theorem), and now they wonder why their core constituency shrinks constantly. They have not improved life for the common man, as social democrcy promises to do, in a long while and its a problem. Meanwhile, the rest of the left (greens), and even the extreme right manages to campaign on left-wing economic issues and gain some serious ground doing it. I once saw a clip of the Vlamsbelang where they were handing out flyers saying “banks must serve the people, not the other way around” Why must we all wait for the right to act on left wing economic issues? that will not do. To a casual observer of the Green Parties, it seems the Green Parties actually do provide a distinct solution which differs from other political strategies and lets voters really feel that their choice Makes A Difference. The Social Democrats do not. They are right-wing policies that are done worse than right-wing right-wing policies since at least the proper right-wing parties at least aren’t boring and hypocritical about their nature. The triangulation of Tony Blair brought Labour to a point where they were considerably more right-wing than the Tories. And they are conservative. Tories want to create a policy looking forward (however much you dislike their visions of the future). Social democrats want to go backwards, or preserve a status quo (and I don’t mean in a way that is back to the 1968 spirit). It’s…. Boring. I try to appreciate social democrats but they’re… Boring. They lack visions, they lack future, they lack inspiration. And to the extent they have inspiration it is by adjusting to the problems formulated by the right. Social democrats are boring. They are not an alternative. That is what needs to change. Luckily, I can help you. I am very inspired and progressive. I also appear to be quite funny because people laugh with me.